The Pull Buoy is a fantastic piece of equipment that allows for the isolation of the arms. In other words, it is the exact opposite of a kickboard. We will now go over how to use the pull buoy, its positive effects and uses, as well as the price range for this item. The Pull Buoy is very simple to use. It is typically placed between the legs, right underneath the groin area. The two inward ridges on the pull buoy are where the legs are placed. Here is a picture to illustrate this. Keep in mind that the pull buoy can be places anywhere between your legs that feels comfortable and that you can squeeze together to keep it in place. The Pull Buoy has many uses and positive effects. Firstly, it isolates the arms, allowing you to focus solely on your pulling technique and endurance. Secondly, the pull buoy keeps your hips up high to the surface, allowing you to get used to swimming with your body flat in the water and your hips high near the surface. 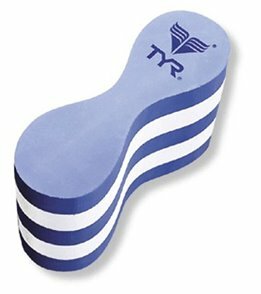 Finally, the pull buoy can also allow you to work on your breathing technique and body rotation without having to worry about what your legs are doing/ having your legs get in the way. Overall, the pull buoy is an extremely effective piece of equipment that is a must for those who have trouble with their legs sinking. The pull buoy typically sells for around $5-12, making it a very inexpensive and effective addition to your swimming equipment. Thank you for reading! Please stay tuned as we have many swimming equipment, olympic athlete bios, and swimming lessons coming your way. Bye for now!